Not many dishes spark as much controversy as chili. Debates rage on over the merits of storebought chili powder versus home ground ancho chilies, tomatoes or no tomatoes, vegetables or only meat, and the most disputed ingredient of all... beans. True Texan chili con carne contains only meat and dried chilies. Purists will argue that if you add any other ingredients then the dish no longer qualifies as chili but with so many regional variations, personal preferences, and secret ingredients that range from the interesting like beer, chocolate, and coffee to the downright bizarre like peanut butter and banana (this one makes me say what the heck), it's hard to say if there's a real right or wrong way. This Super Bowl chili features all of the aforementioned sacrilegious ingredients: vegetable, tomatoes, and beans, though strangely enough this is the chili that everyone is most familiar with since it's the kind thats widely available canned in the grocery store. This recipe is much better than anything that comes in a can and will make a hearty addition to your Super Bowl spread. If you can, make the chili a day before you wish to serve it because it tastes so much better the second day after the flavors have matured. Have a selection of condiments available because the fun part is deciding what to put on top of your big bowl of chili. You can serve the chili by itself, with cornbread, over rice, or my personal favorite, with Fritos corn chips. Heat a Dutch oven over medium high heat. Add a tablespoon of vegetable oil and brown half of the ground beef. Once the first batch of beef is browned, remove the meat keeping the fat in the pan and add the second half and brown the beef. Once all of the beef is browned, drain and reserve. Drain the rendered fat from the Dutch oven reserving two tablespoons of fat in the Dutch oven. In the Dutch oven over medium heat, add the onions, red peppers, garlic, chili powder, cumin, oregano, red pepper flakes, cayenne, chipotle peppers and cook until the vegetables are soft, about 10 minutes. Add the beef, tomatoes, tomato puree, beans, adobo sauce, and bring it up to a simmer. Simmer with the lid ajar for an hour and a half. Remove the lid and simmer another 30 minutes, stirring occassionally, until the chili is dark and thick. If it starts to stick on the bottom stir in a little bit of water. Ideally serve the next day with your choice of condiments. 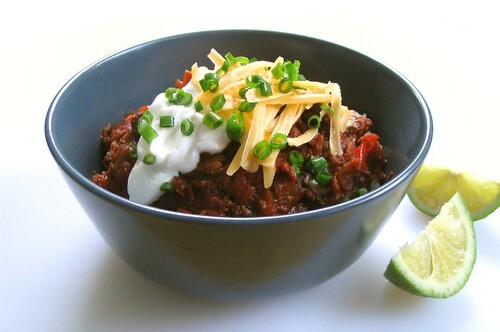 What's better than chili for the Super Bowl?! I'm trying to decide among several favorite recipes... and I'll add yours to the list. I love the haphazard nature of chili -- throw a bunch of interesting things into a pot, and what comes out is almost always delicious. I actually just finished making my chili for tomorrow's festivities. That is a gorgeous image! May I ask what kind of camera you're using? I like having lots of varieties of chili. You can try a different kind every time if you like. This one sounds tasty and looks great! Chili is so much better the next day. :) Thank you! My camera is a super old Canon Powershot A70.